This is a review meant for all three books in the series (the three body problem, the dark forest and the death's end). What a story! The three body problem was suggested to me by a friend. I have never red anything Chinese and I was curious initially. Although the story progress was kind of slow in the beginning, I finally loved it. I continued with the amazing dark forest that moves the story line in another level. I just finished this excellent trilogy with the death's end, a grand finale for a series which I now consider as a classic. Totally recommended to everybody. While the first novel in the series, The Three-Body Problem, relies heavily on scientific theory and actual historical events to help support the reader in understanding the near-future plot, The Dark Forest presents its story with much less reliance on centuries-old theories and foundations of science in order to drive the plot along. The return of some familiar faces help us connect to newcomers to the series quicker, but some characters I found ebbed and flowed in and out of Cixin Liu's second novel in the series without much growth to help us want to care about their outcome. Make no mistake, though, that while it sometimes feels like the plot lingers a littler far too long in some timelines, the actual breadth of the story and time it encompasses brings with it a satisfying-enough ending to the second novel to help answer some questions readers may have, but leaves some waiting for perhaps future explanation. With some truly surprising moments, and some that the reader should be able to guess pretty earlier on in the novels, this novel cements itself as a worth-while follow-up to Cixin Liu's first novel in the series. 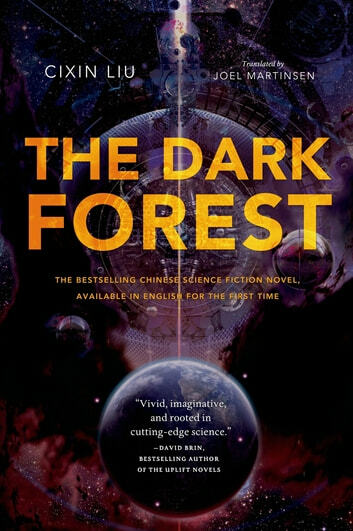 While I found that The Three-Body Problem hurls along, throwing scientific theory and laws of science at you to help you understand the problems faced by society in this near-future, The Dark Forest is allowed to breathe and really become a story of its own without the need to offer much groundwork to help readers understand. This author has a wonderful way of transporting you to different worlds and times in one story. He did not disappoint in this continuation of what I would term a grand story line (trilogy). a tour de force! excellent adult science fiction! THANK YOU!